Next Article What Has Caused the Recent Surge in Requests for the Removal of Permanent Make- Up and Conventional Tattoos? 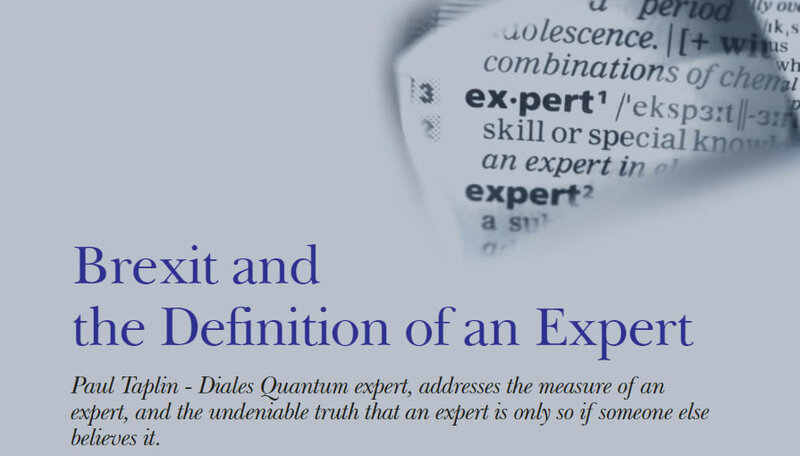 Paul Taplin - Diales Quantum expert, addresses the measure of an expert, and the undeniable truth that an expert is only so if someone else believes it. Whilst I was enjoying my breakfast, watching Sky News, it became clear that the leave campaign was gaining momentum and would ultimately win. The various presenters offered up many reasons as to why the voters had seemingly gone against the majority of politicians and other influential individuals. And then it came… a presenter stated that the UK people voted against the establishment and ignored the advice of experts. Woah! Hang on a minute ignored the advice of experts… surely not. That comment was reiterated a number of times throughout the day, as the shock of Brexit started to sink in and it got me wondering, who are these experts' and why didn’t the voters believe them? It became apparent that the ‘experts’ in question were the financial analysts and advisors who had told the nation that leaving Europe would result in some sort of financial meltdown. Over 17 million people voted to leave, and I’m pretty sure they weren’t all financial analysts and advisors. So why would they go against the advice of an ‘expert’? This got me thinking about whether the voters believed these individuals were in fact ‘experts’ and who defines whether someone is an expert or not? Bringing this back to construction terms, there are numerous individuals in our industry who claim they are 'experts' whether that be in respect of quantum, delay, technical, engineering or indeed a multitude of other specialties. But who says so and what are the criteria? The Oxford English Dictionary defines an expert as, “a person who is very knowledgeable about or skillful in a particular area.’’ This doesn’t seem to be particularly helpful, as who deems that a person is very knowledgeable – isn’t that subjective? My 16-year-old son claims to know everything about everything and, if you were to ask him, he’d tell you he was very knowledgeable in all things related to football and cars. But, when pressed on simple aspects it becomes clear that he’s neither an expert on football or cars, in fact, it seems to me he’s not an expert on anything. I’ve heard many people in our industry say that to be an expert you need to have a sufficient amount of ‘grey hair’. Now, I don’t think that’s meant literally but more of a reference to the fact an expert needs to be experienced. Again, that’s somewhat subjective. Is five years enough? 10 years? 20 years? And indeed, what kind of experience was gained in those years? What about qualifications? Are they important? Can you be a quantity surveying expert if you’re not a chartered quantity surveyor? Some people will say yes, others will disagree. Again it’s subjective. Lawyers have their own views about what constitutes an expert and, for them, one of the key requirements is the need to have experience of being cross examined. This is because a case can be won or lost on the confidence of the expert when presenting evidence at a hearing. ● Have at least 15 years of relevant experience. ● Have been cross examined or completed an approved training course which includes cross examination. ● Spend at least 50% of your time on expert witness commissions. This means that when lawyers or clients appoint a Diales expert they have the comfort of knowing these criteria have been met. Notwithstanding any of the above, it seems to me that many people can hold themselves out as being an expert, but whether or not you really are one will probably be defined by others. If you are appointed and you demonstrate sound knowledge and expertise in a particular field or area, then it’s likely you’ll be appointed again. This will then likely gain momentum and in time you will become an established expert in your own right. My point being that, rather than the individual themselves, it’s actually the market that will dictate whether you’re an expert or not. Going back to Brexit, it seems to me that the voters decided that the financial experts were nothing of the sort and that their forecast for economic meltdown was based on little more than speculation. This was of course a unique event in UK political history, but to me it again shows that it is the opinion of others that defines whether, in fact, you are an expert or not.